Stefanie with Sierra Wildlife Rescue here again. 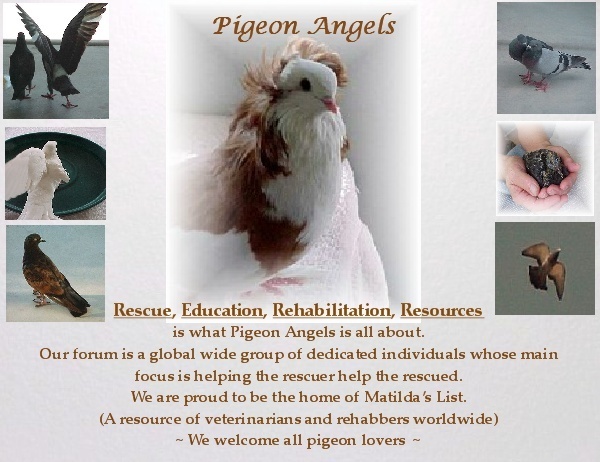 I now have 20 fancy pigeons that now have a clean bill of health and need to be placed in happy healthy forever homes. They all are finishing their molt and some are sneaking in an egg or two. I'm trying to post some pics in my gallery and can't figure out how to post any here so maybe someone can help me. Anyways, if anyone has a wonderful home and an open heart for these lovely birds please let me know. I really would like to get them placed as soon as possible before winter really sets in since I live at 3000ft. I will keep a few but most deserve more space and attention. Send me a note here if you are interested. Good news...you up loaded the pictures to the gallery perfectly, they just needed to be approved by a moderator, which is a built in function of the software in this formum. I have approved the pictures. 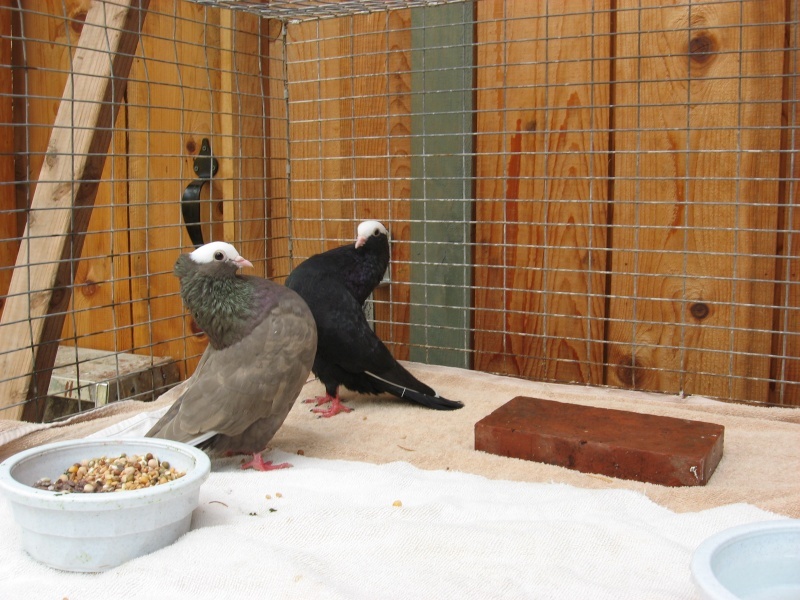 Tell us, are you able to distinguish the birds that are mated pairs in the group? It would be wonderful if you would take pictures of mated pairs so they can be placed together. I think we need a new thread to place them. Appreciate the update on the rescued pigeons, Stefanie. Many thanks for all you have done for them. For easy access here\'s the link to Stefanie\'s gallery photos. They are just beautiful! I wish our 3 rd. 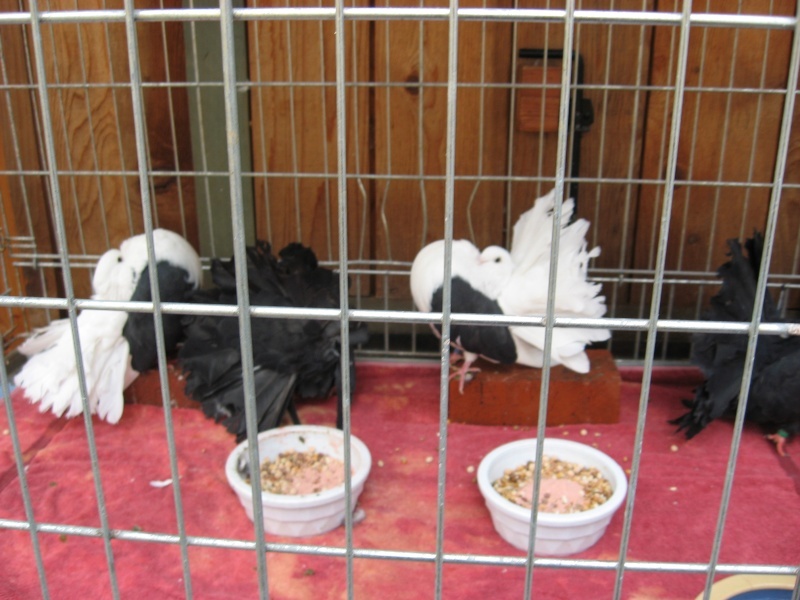 loft was finished & we would adopt some of the fantails. I will try to take photos of pairs. They are all kind of having group pair up at times. Pretty funny. I'm trying to not disturb the gals so I can figure who's who so stay posted. Please spread the word and I'll also post on pigeon talk. I do have some ideas...of course. How many Pigeons are spoken for, Stephanie? We are driving down to Sacramento today to meet Stephanie at her work to pick-up several pairs. I worked on their set-up yesterday and will keep them in isolated for several weeks. Also, will take some shipping boxes that can be used to ship other rescues out and maybe save some money. These boxes are from Charis when she sent me her rescues several years ago. Once these lovely birds are settled in, I will post pictures. * We are driving down to Sacramento today to meet Stephanie at her work to pick-up several pairs. I worked on their set-up yesterday and will keep them in isolated for several weeks. ** Also, will take some shipping boxes that can be used to ship other rescues out and maybe save some money. These boxes are from Charis when she sent me her rescues several years ago. *** Once these lovely birds are settled in, I will post pictures. * Have a safe journey, Joe. *** Will be waiting patiently. We met Stephanie and took three lovely pairs. 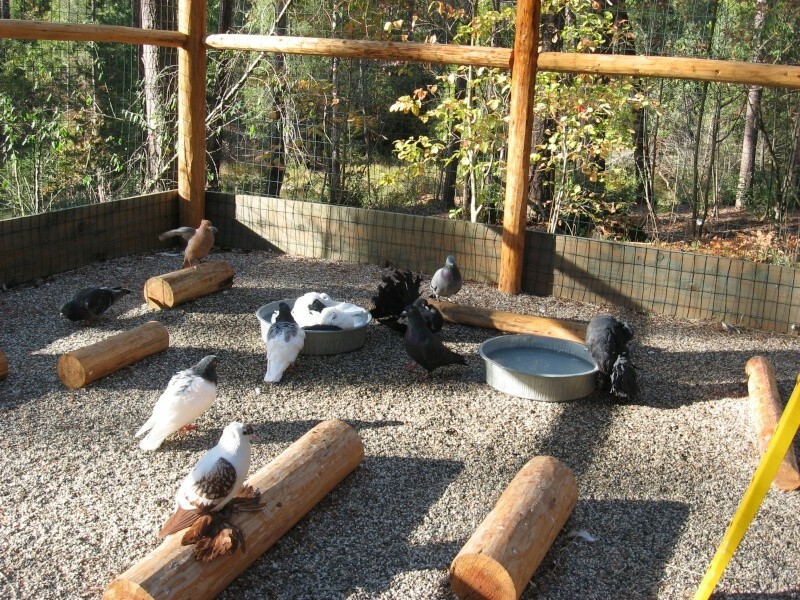 Stephanie did a great job and got the birds healthy again. The fantails are mated (thank goodness) but I cannot yet figure out the Mookies. Thanks again to Charis and Pij-n-Angels for making this rescue a success! The birds are stunning. Love the 'pose' in the first photo. I'm so glad Pij-n-Angels was here to help. Helping the rescuer help the rescued. That's what it's all about. My bonnet goes off to all who were involved in this most urgent rescue. They are lovely, Joe. Looks like the Mookies are part Fantail. My new arrivals were released into the fly pen yesterday. After some snooping around the fantails headed straight for the bath bowls and jumped in. The saddle back fantails laid in the water for five minutes, just soaking and enjoying the sun. 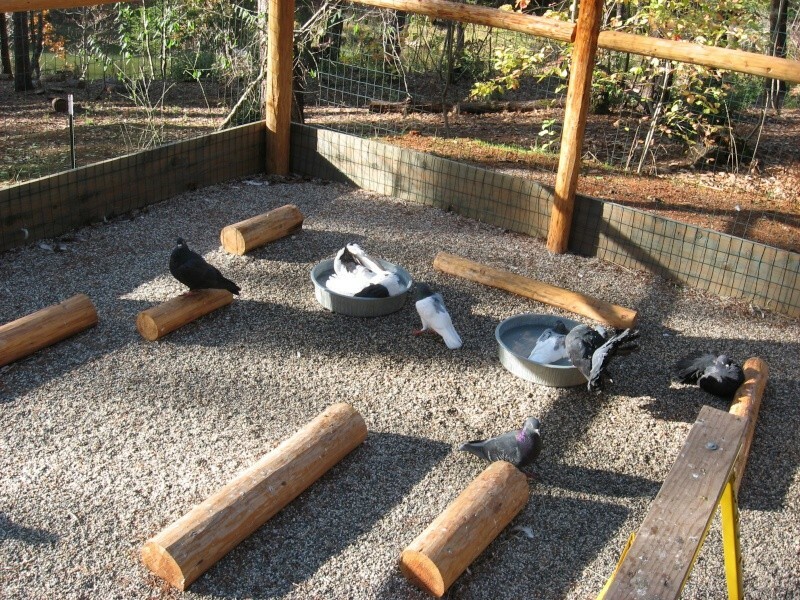 I do not believe these birds ever had baths available in the past. The fantails now have names. The black pair are Porgy and Bess, and the saddle backs Ginger and Astire. Joe................The birds are beautiful. I love the names you have given them. They are certainly enjoying their new home in what I refer to as "Pigeon Heaven on Earth"
Thank you so much for taking them in. Love the names you have chosen for your beautiful new additions, Joe. As with all your pijjies, they look quite happy and content. Many thanks for the update and photos. love the names. Those birds have been rescued and gone to Heaven. Joe you are the bestest! Wow, those birds are so gorgeous! They look so content in their new home. They do not waste any time now do they?